If you’re planning on reusing plastic plant trays for starting seeds indoors, then it’s essential that you clean and disinfect them first. Don’t worry, sterilizing seed trays isn’t difficult. 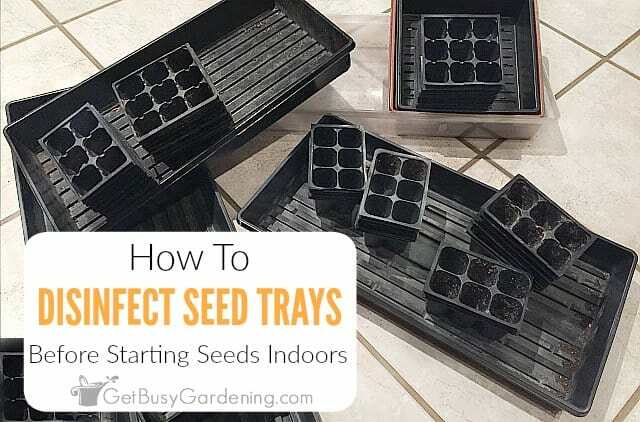 Here are step-by-step instructions for how to clean seed trays. Have you ever had an entire flat of seedlings shrivel up and die on you? This is one of the biggest frustrations I hear people talk about when they are new to starting seeds indoors. There is nothing more frustrating than spending all that time starting your seeds, then getting super excited when they finally germinate, and babying them for weeks… only to watch the entire tray of seedlings shrivel up and die off at the base. Ugh, it’s not pretty! Why Do My Seedlings Keep Dying? The answer to why your seedlings shrivel up and fall over at the base is actually very simple. Your seedlings keep dying because they suffered from a common seedling problem called damping off (also known as seedling blight). What Causes Damping Off Of Seedlings? Seedling damping off is caused by seedling blight, a soil borne disease that attacks and kills seedlings. Damping off is caused by reusing dirty growing flats and trays that have been infected with seedling blight. Seedling blight lives in the soil, and can survive in dirty plant flats and trays year after year. The good news is that damping off is easily preventable. How Do You Prevent Damping Off? To prevent damping off when starting seeds indoors, it’s essential that you disinfect all of your plastic grow trays, seed cells, and seedling tray covers before you reuse them. It’s fine to use brand new seed cell flats and trays right out of the box, but used indoor seed starting equipment should be always be disinfected every time you reuse it. 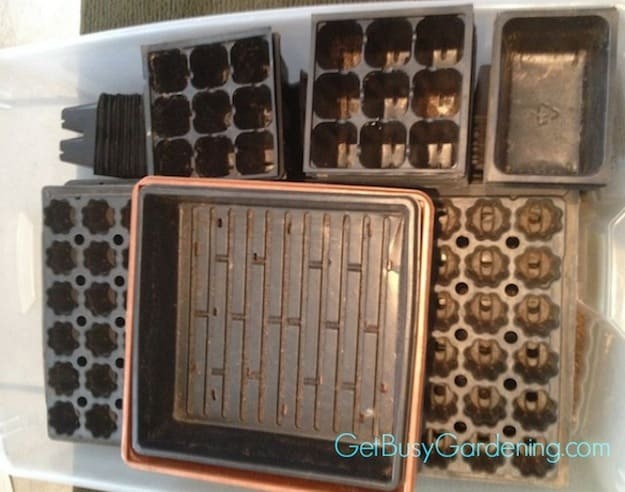 Cleaning and sterilizing seed trays is the easiest way to prevent seedling blight, and it will save you tons of time (and heartache) in the long run. 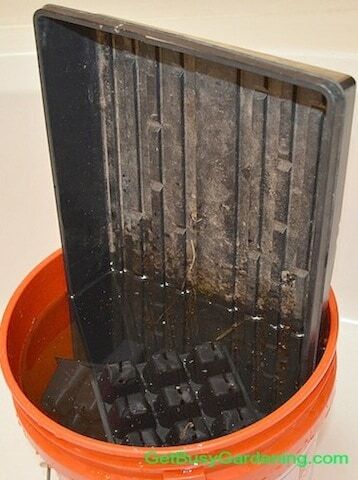 Washing and disinfecting seed trays between uses also helps to prevent mold on seedlings. 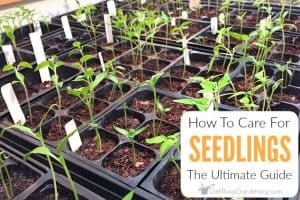 Related Post: Seed Starting Peat Pellets Vs. Soil: Which Should You Use And Why? Step 1: Wipe the loose dirt out of the plant tray inserts and cell trays using a paper towel or small cleaning brush. Step 2: If there’s any dirt that is hardened on, you can soak the seed planting trays and wash them in warm soapy water. You don’t have to be super fussy about cleaning seed trays in this step, but it’s a good idea to remove as much of the dirt as you can. 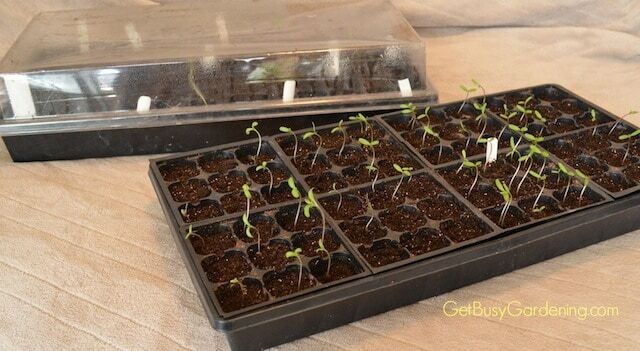 Step 3: After cleaning seed starting trays, disinfect them by soaking them in a bleach and water solution. I recommend using a solution of 1 part bleach to 9 parts water to disinfect your seed flats, and soaking them for 15-20 min. You can use a five gallon bucket to disinfect seed cells and trays, but keep in mind that you’ll have to flip the plant trays over in order to disinfect both ends. My preferred method is using a large plastic bin (which just happens to be the same bin I use to store my seedling trays) so I can sterilize several growing flats and cell trays at the same time to speed things up. Step 4: Once they’re done soaking, give them a quick rinse and let them air dry. Now they are sterilized and ready to use for starting seeds. Ok, ok – I know what you’re thinking. Yes, disinfecting seeds trays and cells will take you a little extra time, but the effort is well worth it to ensure your seedlings have a healthy start. 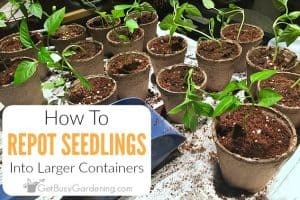 Trust me, skipping this step in order to save yourself a little extra time is not worth the risk of your seedlings dying. If you don’t have any seedling trays yet, you can find them for sale anywhere you can buy seeds. Keep in mind that many big box stores and garden centers won’t carry seed starting supplies until late winter or early spring, so sometimes you have to be patient. Of course, you can always find seed starting kits for sale online at any time during the year. If you don’t need the whole kit, you can find cell inserts, humidity dome lids and seedling trays for sale separately. Dealing with damping off is definitely one of the biggest struggles many gardeners face when starting seeds indoors, and it is no fun! 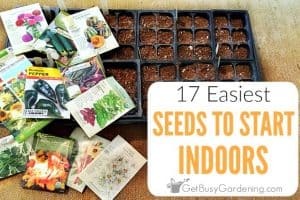 If you struggle to successfully grow seeds indoors, then my Starting Seeds Indoors eBook is for you! It’s a quick-start guide that will give you the guidance you need to get your indoor seedlings off to a heathy start! Download your copy today! 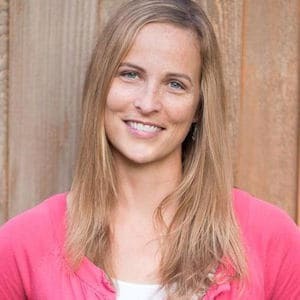 If you want to take it to the next level, and learn exactly how to grow your own seeds step-by-step, then my Online Seed Starting Course would be perfect for you! This comprehensive online course includes guidance and support, and provides everything you need to learn in order to grow any type of plant you want from seed. 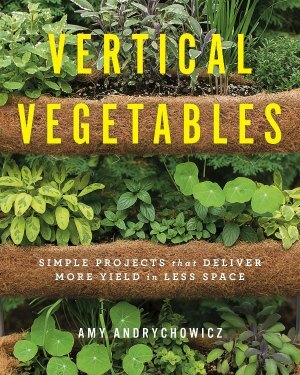 With this fun course, you will learn everything you need to know about growing seeds for your garden! Enroll in the course today! 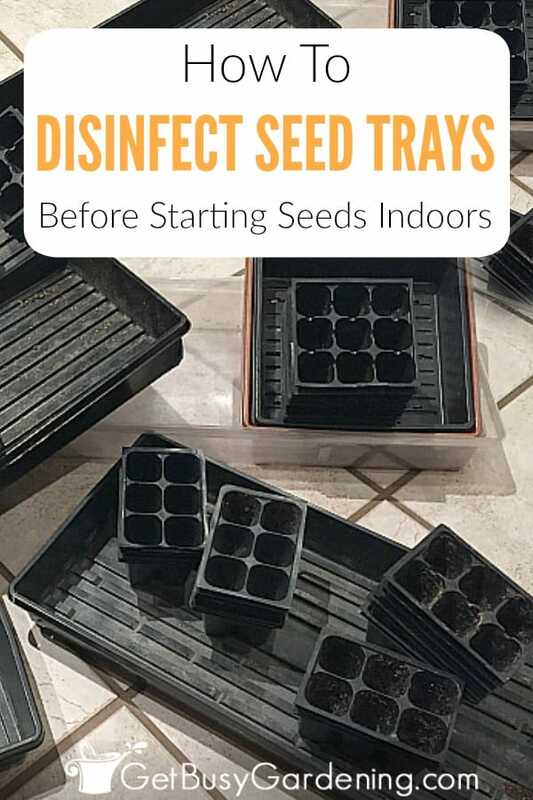 Share your tips for disinfecting seed trays in the comments section below. Maybe I'm lucky, but I've never had a damping off problem, and I never wash my dirty pots — I definitely never use bleach solution on them (too much work). I'm certain I'd start doing this as soon as I had some losses due to damping off though. Hi Tessa, Thanks for your comment! You'll have to tell me more about the chamomile tea. I'm guessing it might kill the bacteria that causes damping off? I will look that up, thanks for the tip. Hi Alan – yes, you have been lucky! I also reused my flats for a few years without any problems…then one year lost almost all of my seedlings at once. It was devastating! Hard lesson to learn. Thanks for this tip. I was going to reuse some trays this year and never even thought of cleaning them. Any thing else I need to watch out for? If you do the disinfecting in your bathtub you can clean all your trays at once. And bonus, scrub down your tub after for a disinfected tub 🙂 Rinse well afterward, obviously. I’m so lazy I’ve never done this but I have lost trays of seedling as it is SO disheartening when they are doing so well then suddenly half the tray is flat and sad! I’m sure I remember my Granddad doing this now I see it, he was a great gardener. I guess a little extra time at the beginning can save a lot of time and trouble later., thanks for the great advice. It’s not a huge concern since the bleach is so diluted, plus the seedlings don’t grow in the trays for very long before you pot them up or transplant them into the garden. Make sure to rinse the seed trays really well after soaking them too. If you air dry the trays in the sun for a couple of hours then the UV light will break apart any bleach molecules and release them as chlorine gas into the atmosphere. That said, it’s really not a concern at all at these dilutions. I just attended a gardening course and it was suggested to have an oscillating fan on gentle during the day, just enough to move the air around. It’s supposed to make the plants more sturdy, like growing outside with some breeze. I think it might help with damping off as well. Yes, I also recommend using an oscillating fan on seedlings, it helps prevent mold growth and strengthen the seedlings. However, it probably wouldn’t help to prevent damping off, because that is caused by seedling blight, which is a soil borne disease. So, if dirty seed trays are already infected with the disease, then using a fan isn’t going to keep the disease from spreading through the soil. I planted my seeds in peat pots yesterday and put them in the covered trays that I used last year. The trays were kept in the basement and last nite I went to put a little water in the trays and when I lifted the cover there was a moldy smell. No dirt was left in trays while in basement but anything I keep down there ends up smelling moldy. This morning I washed the trays and lids with dawn dish soap. If the moldy smell has permeated the plastic will it hurt my plants? I wouldn’t worry so much about the smell, but if you didn’t disinfect the trays before you used them to plant seeds, then I would worry that you could have issues with mold or seedling blight from the dirty trays. 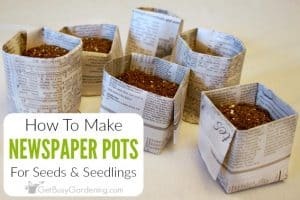 Since you used peat pots, you could try remove the pots and disinfecting the trays now to try to get ahead of any problems.